For the first chapter of 2019, the Swiss Léna Bühler joined the ranks of women in karting. As usual for this feature section, it is important to focus the spotlight on the women of this sport, widening the circle of girls in racing. Driven by adrenaline, a spirit of competition and having grown up in the Swiss motoring passion, the 1997-born Léna Bühler, is preparing to experience 2019 at the highest level. The Swiss karting driver was one of the most interesting figures of the recent Iame International Final and there was more; her participation in the 24h of Le Mans with an all-female team. Léna Bühler will kick off her 2019 as early as the upcoming Winter Cup which will see her start in the OK class. But what prompted Lena to take the road to karting? And what are her goals for the future? Let's find out below. - Lena, when did you start running? 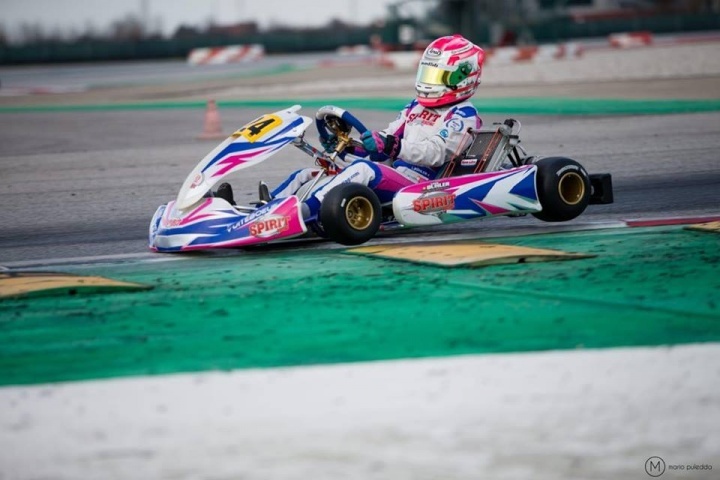 «I got into my first kart at 10 but started racing a little over 2 years ago». - Why did you choose this sport? «I like adrenaline sports and fighting boys gives me even more motivation to reach my goal». - What are your most beautiful memories up to now? «In 2018, I participated in the 24 Hours of Le Mans with a 100% female team. It was a great experience. In all races where I participated, the memories is the passion». - How was the 2018 season? Which race will you do in 2019? «The year 2018 went well. I learned a lot and progressed. There were ups and downs as for every driver. I participated in races, national and international - 19 in total. This year I will participate in the Swiss Championship X30, Euro Series X30, Winter Cup X30 in Valencia, Winter Cup in Lonato OK and Iame International Final». - What do you think about the level of competitiveness of the girls? «We're not many, but I think the level's clearly good. It's obvious that currently we're talking about a budget problem. Training, circuit racing is very important for the experience of a driver to achieve great results». - How do you treat your male rivals on the track? «It's as if it's natural to drive with boys. I don't even care about the difference. For me, we're all equal». - What would you say to a girl who wants to start with karting? «I'll tell her it's a great idea. By telling her about my experiences».